Welcome to the Farm Heroes Saga All help blog! Now available as a mobile app!!.. 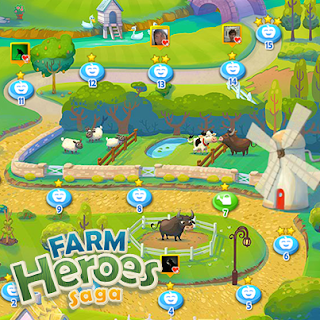 Farm Heroes Saga is a very similar game with a few twists. Instead of candies Farm Heroes Saga uses fruits and vegetables to switch around and some levels have a raccoon called Rancid who you have to defeat by throwing fruit at him! On the right of this site you will find level guide videos and on the left will be hints and tips and help for playing this game as well as others. Sound effects are fun and still make me smile after completing the whole 70 levels available at the time of writing. If you are waiting for new levels in Candy Crush, or just fancy a new twist to the game play Farm Heroes Saga by clicking on the image below..